Hardcover with jacket, 360 pages, 13.5 x 21.5 cm, 5.3 x 8.5 in. "ORIGIN is a book about the first coincidence in our biography: being born somewhere. And about what happens afterwards. ORIGIN is a book about the places that are my home, the ones in my memory and the ones I have invented. It is a book about language, moonlighting, youth and many summers. The summer when my grandfather trod on my grandmother's foot while dancing in such a way that I was almost never born. The summer when I nearly drowned. The summer when Angela Merkel opened the borders and which was very like the summer when I fled across many borders to Germany. ORIGIN is a farewell to my grandmother with her dementia. While I am collecting my memories she is losing hers. ORIGIN is sad because for me origin has got something to do with what I can no longer have. My biographic writings, also this text, are like the name on the doorbell of a man long since dead that I can no longer remember – an attempt to preserve something that used to be important. To preserve it, but also to develop it further in one's mind, to get to the bottom of it." 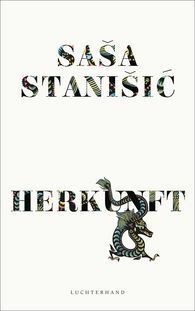 "Saša Stanišić is a poet and revolutionary who has found his true home in language."